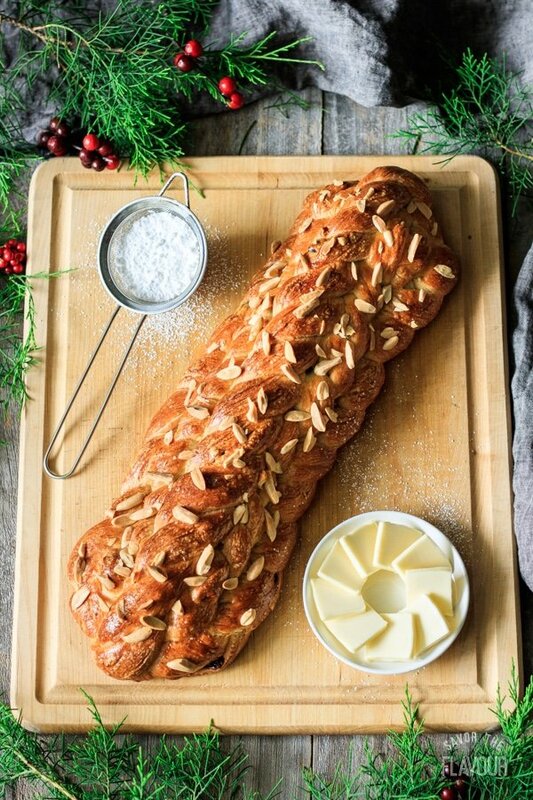 Vánočka is a traditional Czech Christmas bread that’s made up of three beautiful braids. This recipe makes one delicious loaf that your family will love for Christmas breakfast. Serve it with a cup of hot cocoa and lots of butter! The name of this bread is derived from the Czech name for Christmas: Vánoce. 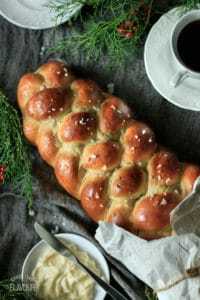 Interestingly enough, vánočka used to be called houska, but nowadays houska refers to an individual-sized braided bread sprinkled with poppy seeds or sesame seeds instead of a big sweet loaf. Since vánočka is a tricky bread to make, many customs have arisen to “help” the bakers make a perfect loaf. Although these customs won’t guarantee a successful loaf, you might have fun trying some of them! For some step-by-step help, I highly recommend watching this 36-minute video recipe from Kristýna Montano, the blogger behind Czech Cookbook. Don’t be tempted to add extra sugar. Sugar is hydroscopic, which means it’s attracted to water. Having too much sugar in the dough will rob the yeast of moisture, slowing down the rise or halting it altogether. Let the dough rise in a warm place to speed up the prove. Since this dough has a lot of enrichments that make the dough heavy, the yeast has to work harder to grow the dough. Putting the dough in a warm place encourages the yeast to grow. 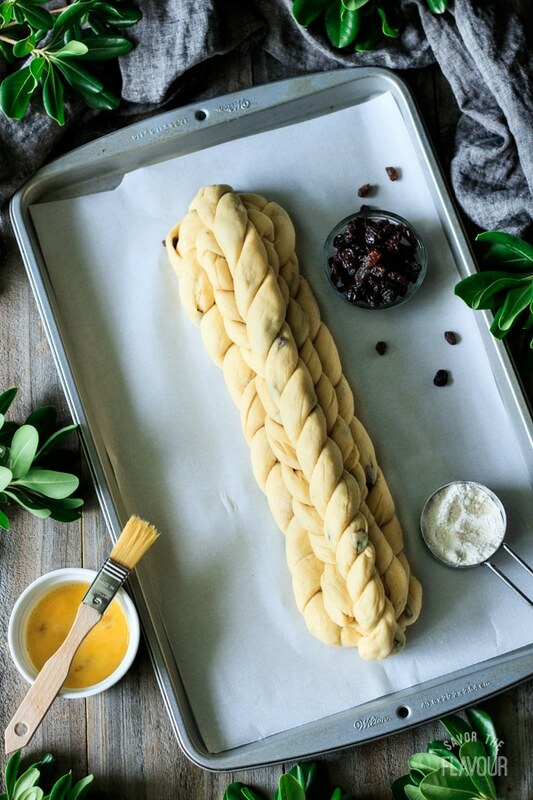 Braid the strands of dough tightly. A loose braid won’t look as polished as a tight one. Bake the bread on a double cookie sheet to help keep the bottom from burning. Stack the cookie sheet with the loaf on top of another cookie sheet. The layer of air between the two sheets will insulate the bottom of the loaf, helping to avoid a burnt base. What ingredients make this enriched bread soft and flaky? The butter, egg yolks, milk, and cream make the dough soft. The large quantity of butter in this dough makes it quite flaky, reminiscent of a croissant. What is the symbolism in the braids? The three braids represent Baby Jesus in the manger. It is a Christmas bread. 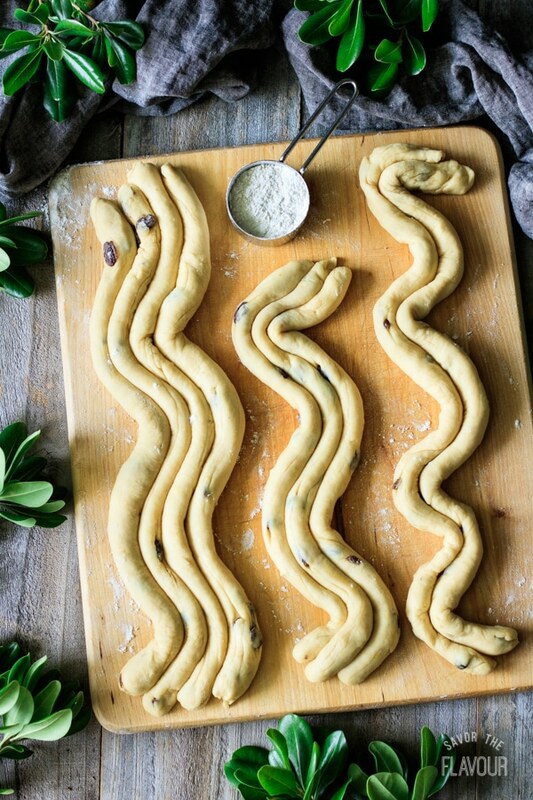 Each loaf of vánočka is made from nine strands of dough, braided into three separate braids. The bottom four strands represent the four key elements of earth: fire, water, earth, and air. The middle three strands stand for the three traits of humanity: reason, will, and feeling (emotion). The top two strands represent the two qualities that draw us closer to God: love and knowledge. What is the best flour to use for vánočka? In the Czech Republic, bakers typically use 400g of hladka and 100g of polohruba to make vánočka. But what is hladka and polohruba? They’re two types of Czech flour (called mouka in Czech), the ones most commonly used for Czech baking. Since we can’t easily buy hladka or polohruba in the US, substitute all-purpose flour for the hladka, and bread flour for the polohruba. Hladka: the finest-ground flour, most similar to all-purpose flour in the US. Polohruba: a semi-coarse flour with more gluten than hladka; more like bread flour. Hruba: a coarse flour often used for dumplings. Krupice: the coarsest flour; comparable to semolina. If you like this vánočka recipe, you’ll like these other delicious sweet breads! 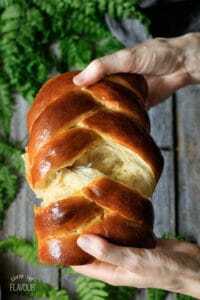 How to Make Easy Challah Bread: a soft and fluffy Jewish bread your family will love. 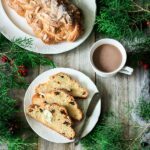 Pulla: Finnish Cardamom Bread: serve this yummy bread with a cup of coffee for an authentic Finnish treat. Kanellangd: Swedish Cinnamon Bread: a delicious cinnamon bread often made at Christmas in Sweden. Did you make this vánočka? Please leave a recipe rating and share how you liked it! Stir together the milk and cream and heat the mixture to 115 F.
Pour the two flours into the bowl of a stand mixer and add the salt and yeast on opposite sides of the bowl. Stir in the salt and yeast with your finger, making sure the salt doesn’t directly touch the yeast, as it can kill the yeast. Add the sugar, lemon zest, melted butter, egg yolks, and raisins, then mix with the paddle attachment on low speed until blended. Gradually trickle in the milk, keeping the mixer on low speed, then do the same with the water until a soft, sticky dough forms. You might not need all the liquid, or you could need a little extra, depending on the brand of flour and humidity. Switch the attachment to a dough hook and knead on medium-low speed until the dough pulls away from the sides of the bowl. 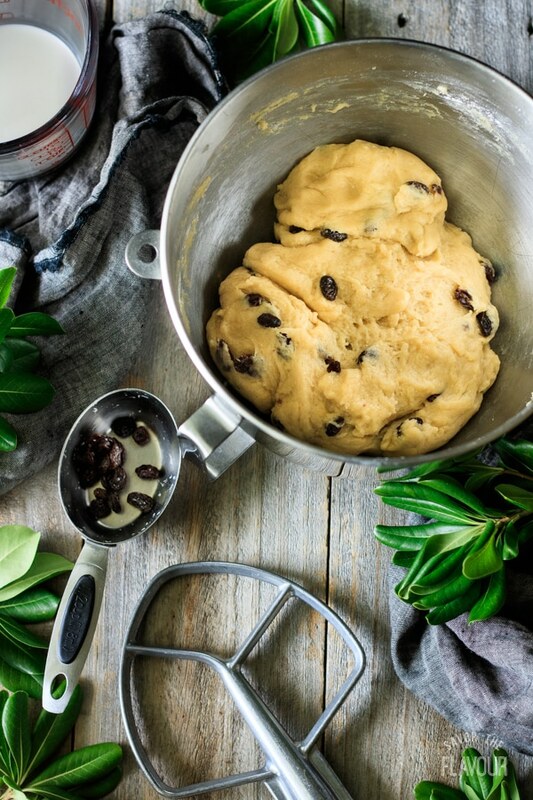 If the dough is excessively sticky, add a little all-purpose flour, but make sure the dough is tacky to the touch. Flour the base and sides of the mixing bowl, and dust a little flour on top of the dough. Cover tightly with plastic wrap and let it prove until the dough is almost doubled in size, about 2 1/2 to 3 hours in a warm place. Turn out the dough onto a very large, lightly floured wooden cutting board. Divide the dough into two pieces, one about 60% of the dough and the other 40%. Cut the larger piece into five equal pieces, and the smaller piece into four equal pieces. Gently roll each piece into a rope. Divide the ropes into three groups. Put the two longest strands in one group, and the three shortest ones in another. The remaining four strands are the third group. Place group of four strands side by side and join them together at the top. Stick them to the work surface by pressing down firmly with your thumb. Think of the strands of being numbered from 1 through 4, from left to right. Bring 4 over 3, then bring 2 over 1. Cross the new strand 2 over strand 3. Repeat this sequence until the whole loaf is braided. Place the four-strand braid on the prepared cookie sheet and use the side of your hand to create a valley down the middle of the bread. Brush the valley with beaten egg. Lay the group of three strands side by side and braid. Pinch the ends to seal, then make a valley down the middle as before. Place the second braid on top of the previous one, making sure it’s centered. Brush the valley with beaten egg. Roll the two remaining strands so they’re just a couple inches longer than the loaf, then twist them together tightly. Place the twist on top of the loaf, tucking the ends of the twist under the other two braids. Cover the cookie sheet with a clean tea towel or a large clean garbage bag, and set aside to prove for 1 hour in a warm place. The loaf should increase in size. About 10 minutes before the bread is done proving, preheat the oven to 350 F.
Gently brush the loaf generously with beaten egg. Stack the cookie sheet with the bread on it on top of another cookie sheet to help keep the bottom from burning. Bake in the middle of the oven for about 45-50 minutes. If the loaf is getting too dark, cover with aluminum foil. Bake the bread until it has an internal temperature of 190-200 F.
Let the loaf cool completely on a wire rack before dusting very lightly with icing sugar from a sieve to look like snow. Serve the loaf sliced with lots of butter. 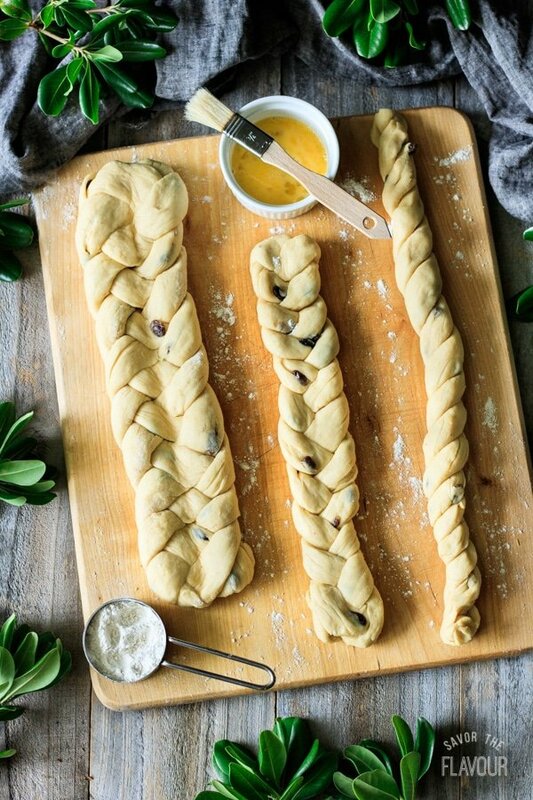 If you’re concerned that the braids might slip off each other as they rise and bake, insert a few pieces of wooden skewers into the bread to pin it in place. There’s a traditional way to check to see if the loaf is baked. Insert a wooden skewer into a crease of the braid and poke it all the way to the bottom. The skewer should come out clean; if not, bake for another 5 minutes and check again. The vánočka can take about 2 hours to cool completely on a wire rack. Store leftover vánočka in a plastic bag on the counter, or freeze for later. This bread looks so wonderful Emma. If I try to make it, I’ll let you know. Love the history behind it. I’m imagining all these women jumping in their kitchens!